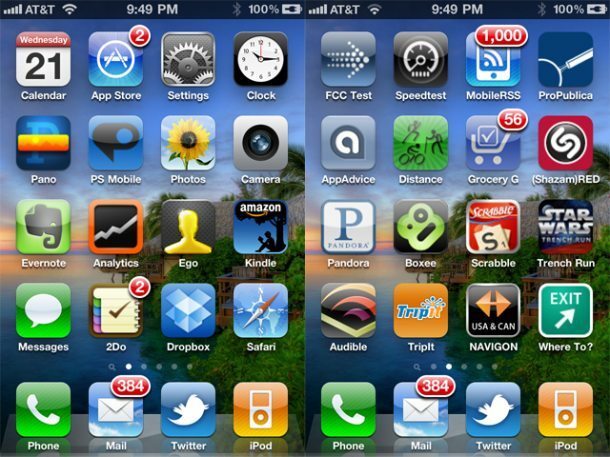 Mobile apps have become an embarrassment of riches. In a world with over 200,000 iPhone apps and over 100,000 Android apps, the toughest part is finding the most useful stuff. For iPhone users, I’m going to throw you an assist by sharing my top 25. These are third-party apps that can help you be more productive, streamline several of your activities, reduce the number of gadgets in your life, and take advantage of the best benefits that mobile computing has to offer. I’m also going to follow up with similar lists of the best apps for Android and iPad. Dropbox is a great cloud service that automatically syncs a folder of files between multiple computers (Windows, Mac, or Linux). This app extends Dropbox to the iPhone and includes a built-in reader within the app for PDFs, image files, and Microsoft Office files. There are a ton of to-do apps on iPhone but I prefer 2Do because of the great interface and the fact that it can sync with the online service Toodledo. I love Tripit. It is by far the best app I’ve found for keeping track of all my travel itineraries. It runs off some great backend systems. You simply forward your confirmation emails for your flights, hotels, rental cars, and more to Tripit and it automatically organizes them into trips with all your details and confirmation numbers. For some reason Google doesn’t have an official app (for either iPhone or Android) for Google Analytics. The best one I’ve found to get deep into all of the data is Analytics App. Even better than Analytics App for a quick-glance dashboard is Ego. It shows basic data from Google Analytics as well as a bunch of other sources, including Squarespace, Twitter, and Feedburner. The official Twitter app (formerly known as Tweetie) is still the best Twitter client on iPhone (although Osfoora is catching up), and Twitter is an amazing instant-intelligence engine. Twitter has largely replaced RSS for me for finding and filtering the latest news. However, I still track some RSS feeds and the best tool I’ve found to do it with is MobileRSS Pro, because of its clean UI and integration with Google Reader. I don’t use many specific publication apps to get news. I mostly get news from Twitter and RSS, but the one major exception is ProPublica, the non-profit investigative journalism site. Excellent reporting and a very good app. I never warmed up to the Amazon Kindle e-reader, but I’m a big fan of the Kindle iPhone app. Since it was released I’ve read a lot more books simply because my phone is always with me and I can pull it out and read a few pages anytime I’ve got a couple minutes free. As much as I like the Kindle ebooks, I actually consume more books as audiobooks via Audible. In the past you could download these and sync them via iTunes. But Audible now has its own app, which lets you connect to your Audible library and download over the air, and even gives you a self-contained player optimized for audiobooks. Photoshop is, of course, the best known photo editor in the world and its mobile app doesn’t do anything to hurt that reputation. But while the desktop version is known for having a zillion features, the mobile app is distinguished by its simplicity. It’s the best iPhone photo editing app for simple crops, brightness adjustments, and sharpens, for example. Pano makes it easy to take excellent panoramas with the iPhone. It helps you line up your shots and it automatically corrects many of the imperfections. My wife is a photographer with a big, expensive camera and she’s regularly jealous of some of the shots I can get with the iPhone and Pano. I’m always running speed tests to check my bandwidth in various places, both to see 3G fluctuations and to check the quality of Wi-Fi. The Xtreme Labs test is my favorite (it’s also available on Android). It is very consistent, although sometimes its upload speeds seem a little lower than reality. That’s why I’d recommend that you verify it by using other speed tests such as the FCC Speed test, Speedtest.net, and the Cisco speed test app. This is a great app for shoppers. It turns the iPhone camera into a barcode scanner and it’s pretty accurate. You simply scan a product’s UPC code and let the app go to work to find it in Google Product Search and TheFind. For food it will even look up allergen information and for books it will scan to see if you can get it in a local library. You’ll be amazed at how fast it works. A similar product is SnapTell, which not only scans barcordes but you can also take a picture of the cover of a book or DVD and it can look them up that way. These apps are great when you’re shopping at a retail store and want to check the prices of products online before buying. I used to carry a separate Garmin GPS unit for turn-by-turn directions but I eventually got rid of it and decided to just use the iPhone instead. In researching the various apps, I eventually decided on NAVIGON, which is a company that makes a lot of the built-in navigation systems for many cars. Tip: Make sure your iPhone is plugged in to power when you run a GPS navigation program like this because otherwise it will quickly drain your battery. A great companion to a GPS system is the app “Where To?” which lets you quickly look up various types of shops and services, from Cuban restaurants to medical specialists to animal hospitals to local museums and much more. This terrific little app can save you from buying a pedometer. It uses the iPhone’s accelerometer to track the miles you’ve run or walked, and it also throws in data about your pace and the number of calories you’ve burned. Pandora is a streaming “radio station” for the Internet age. You simply search by an artist or song and it will create a running playlist based on that one piece of information. It intersperses an occasional ad between songs but the ads tend to be fairly localized and occasionally even useful. On iOS 4, Pandora can even run in the background, just like the iPhone’s native music app. If you want to impress your friends with an iPhone app, the best one to do it with is Shazam. Ever hear a song being played at a store or on the radio and ask yourself, “Oh, what song is that?” That’s where Shazam comes in. Just hit the button and let it listen for 15 seconds, query its database, and then return the name of artist and the song. It has about an 80% success rate. This is an app plus a website and you can quickly sync between the two. The way it usually works for me is that my wife makes a grocery list, enters it into grocerygadgets.com, and then it syncs to my iPhone so that I can swing by the grocery store on my way home from work. Boxee is a great little program that lets you turn any PC into a multimedia PC and brings social networking to the experience so that you can see what your friends are watching. It runs on Mac, Windows, Linux, and AppleTV. However, if you use an existing PC then you probably don’t have a remote for it. This Boxee app turns your iPhone into a remote with two modes, a straight arrow mode and a gesture mode. This classic game has gotten a rebirth in the digital age and the iPhone version is part of that. You can pass the phone around or you can play online against your Facebook friends. I’m not usually an avid gamer (beyond Scrabble) but when it involves an X-wing Fighter attacking the Death Star, I’m in. Star Wars: Trench Run is a fun game that’s easy to play and takes advantage of the iPhone 4’s new gyroscope. A cool feature of Star Wars: Trench Run is that you can also connect it with your computer using a wireless technology called Brass Monkey and then you can have the game playing on a PC or Mac while you use the iPhone as a controller. However, be prepared to install a plug-in on your computer and you might have to open ports on your firewall to make it work. There are even apps to help you find more apps (that’s what happens when a platform has over 200,000 apps). A great resource is AppAdvice. Its AppGuides and AppLists are great ways to discover new apps. I especially like that it ranks similar apps in order to help you find the best ones. Buying a new or used car might be a hard approach should you not know what you will be performing. By educating yourself about auto store shopping prior to deciding to visit the dealer, you can make things much easier on your own. The following tips can help your upcoming purchasing trip be a little more enjoyable. Always take a technician coupled when searching for a new automobile. Car retailers are notorious for marketing lemons and you may not want to be their up coming sufferer. Provided you can not get yourself a auto technician to think about vehicles with you, no less than be sure that you have him evaluate your closing decision before you purchase it. Know your limits. Before you start purchasing for your upcoming car or vehicle, choose what you can manage to pay out, and adhere to it. Don’t forget about to feature desire for your calculations. You are likely to shell out close to 20 % as an advance payment too, so be well prepared. Well before attending a car dealership, know what type of automobile you desire. Study all you possibilities just before store shopping to help you decide what works well with your financial allowance and household needs. Do your research to find out simply how much you should be paying for the prospective automobile. Before signing any commitment make time to study every single series, including the small print. If there is something shown that you simply do not comprehend, tend not to signal till you purchase an respond to that you fully grasp. Unsavory salesmen can make use of a contract to place numerous fees that had been not reviewed. In the event you maintain the previous advice in your mind the next time that you just go shopping for a auto, you will certainly be more likely to obtain a good deal. Investing in a car does not have to be a headache. Simply use the ideas from this article and you could get the auto you want at the great value. hOur site offers a wide variety of non prescription drugs. Visit our health site in case you want to look healthier with a help health products. Our company offers supreme quality health and related products. Look at our health contributing portal in case you want to look better. Our site offers a wide variety of non prescription drugs. Visit our health website in case you want to strengthen your health with a help health products. Our site offers a wide variety of non prescription drugs. Look at our health portal in case you want to to feel healthier with a help of generic supplements. Our company provides a wide variety of non prescription products. Visit our health site in case you want to feel better with a help of general health products. Our company provides a wide variety of non prescription products. Look at our health site in case you want to to feel healthier with a help generic supplements. Our site offers a wide variety of non prescription drugs. Take a look at our health portal in case you want to look better with a help of generic supplements. Our company provides a wide variety of non prescription products. Take a look at our health portal in case you want to strengthen your health with a help generic supplements. Our company provides generic supplements. Visit our health contributing website in case you want to improve your health. Our company offers a wide variety of non prescription products. Look at our health website in case you want to feel better with a help generic supplements. Our site offers a wide variety of non prescription drugs. Take a look at our health portal in case you want to to feel healthier with a help general health products.